Billionaire owner Roman Abramovich expects Chelsea's spending in the transfer market to be reduced once the benefits are reaped from its academy. European governing body Uefa may make football more competitive by curbing investment by rich benefactors. 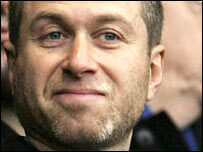 Russian Abramovich has spent millions since taking over at Chelsea in 2003. But he told The Observer: "Our strategy is to bring up our own players through the academy, which we have invested a lot in, and hope it gives results." He added: "We will be spending less in the transfer market in future years." Abramovich also denied that he had any involvement in picking the team. However, he did confirm that he does influence Chelsea's business in the transfer market, although he insisted that boss Jose Mourinho has the final say. "I am not involved in team selection," he said. "I cannot say I am completely not involved in buying players but my role would be significantly lower than that of the manager's. "You cannot compare them. To give an example, this would be an impossible situation where a manager does not want a player to be bought and I try to impose ideas. It would not work." It follows reports that suggested Abramovich was behind the decision to buy striker Andriy Shevchenko for £30m from AC Milan in May. The 40-year-old stressed he was committed to Chelsea and would not lose interest if the club won the Premiership for a third successive year. "People who know me said I will win one or two Premierships and will not be interested after that," he stated. "The reality is that we have won two Premierships but I am more excited about this particular season than last year or the year before. "I am getting excited before every single game. The trophy at the end is less important than the process itself." Abramovich also gave an insight into his relationship with Mourinho. "We do not have friendly relations but they are warm enough. Generally speaking, I treat him with great respect," he revealed. And the Russian hinted that he has no ambitions to see Chelsea enter a European Super League. "I don't see the risk of that," he said. "Money plays an important role in football but it is not the dominating factor. "I don't have an opinion about Chelsea playing in a Super League. "My feeling would be that you lose something of the beauty of the Premiership by joining something not defined at the moment."